Anyone lamenting the sweaty, grime-coated nature of their daily commute might find a heartening sense of perspective by watching 'Hell On Wheels', a new, brutal historical drama from Endemol USA (airing on TCM in the UK) that charts the building of the Union Pacific Railroad in post-Civil War America, starring Colm Meaney and sometime-rapper Common in leading roles. Meaney plays Thomas Durant, an enterprising and utterly unscrupulous businessman who plans to realise his vision of building the transcontinental railroad and make himself a fortune into the bargain. The railroad building itself is a mammoth undertaking, beset by numerous difficulties and opposing factions, including the recently emancipated slaves that make up the majority of the workforce. For them, the work is merely a repackaged form of slavery. Common’s character, Elam, is a recently freed slave working on the digging crew. He radiates a volatile mixture of defiance, resentment, ambition and pride, all executed with a surprising amount of skill by Common, whose most notable appearance on screen to date has perhaps been as the voice of Seymour in 'Happy Feet 2'. Another major character in the sprawling ensemble cast is Cullen Bohannon (Anson Mount), a taciturn lone ranger on a quest to avenge the murder of his wife. With a lazy drawl, dry wit, measured speech and a generous helping of moral ambiguity, he’s an anti-hero cast in the 'Fistful Of Dollars' mould. The makeshift town of "Hell On Wheels" serves as the crucible that brings these characters together – a dusty, joyless place lubricated by prostitution, liquor and bloodshed. 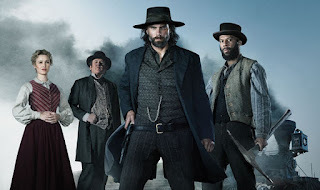 It’s a setting that lends itself well to drama, and the first two episodes of 'Hell On Wheels' lay down complex foundations for the rest of the series. Every character seems to have an intriguing back-story to be explored, and it will be interesting to see whether the series manages to draw all these threads together into a cohesive whole. I particularly enjoyed the fact that, in spite of the period setting, the script still had a sense of knowing relevancy. It’s easy to recognise the posturing of modern politicians in Durant’s grandiose speeches, to see echoes of recent scandal in his casual bribing of public officials, and – amusingly – to witness the ease with which he dictates a heavily embellished news story to a journalist. In the particularly ‘meta’ speech that concludes the first episode, Durant soliloquises: “And what is the building of this grand road, if not a drama? This business is not for the weak of heart.” This sounds like a challenge and a promise rolled into one – I hope the series delivers. It’s off to a good start. 'Hell On Wheels' airs every Sunday on TCM UK, and the first episode is repeated tonight at 9pm.